Holiday Party Festivity LevelsLevel I: Your guests are conversing quietly, nibbling at their hors d’oerves, and sipping their drinks. Later, some of the gather by the piano to sing carols while others admire the ornaments on your tree. 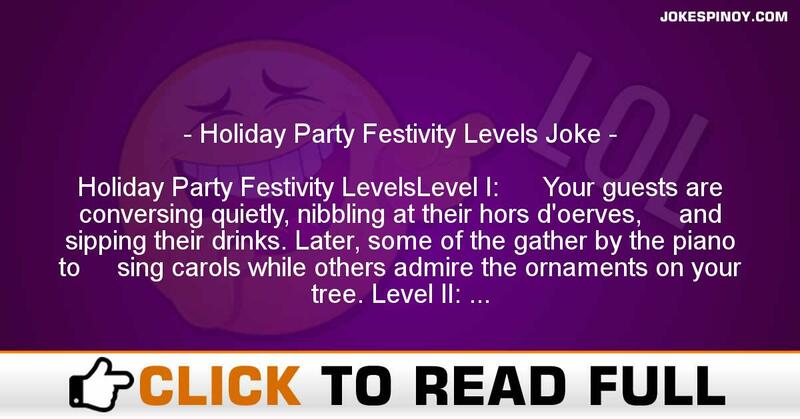 Level II: Your guests are talking loudly, wolfing hors d’oerves, and drinking from the bottles. Some people gather by the piano to sing “I Gotta Be Me” while others begin rearranging your ornaments. Level III: Your guests are arguing wildly among themselves, those that haven’t passed out from the upside-down margaritas. One person is singing “I Can’t Get No Satisfaction”, which can barely be heard over the sound of breaking ornaments. A small group of guests begin placing hors d’oerves in the piano to see what happens when the little hammers strike. Level IV: Your guests, hors d’oerves smeared over their naked bodies, are performing a ritualistic dance around the burning Christmas tree. The piano is missing. In general, you want to keep your party around Level III, unless you rentyour home, have insurance, and are carrying firearms. The quickest way toget to Level III is egg-nog. ABOUT US : Laughter is the greatest medicine as the old saying says, we at JokesPinoy.com will provide you with all the comical filipino quotes and pictures in tagalog language. Back in 2013, a group of Filipino OFW (Overseas Filipino Worker) got bored and they attempt to look for some funny quotes online simply to have fun but sadly most of the websites they discovered on that time are having an obsolete jokes and have no interaction with the users. From that instant, they subsequently got an idea to build their very own jokes website and let other users to give their jokes or comment together with the present jokes. After the funds and ideas gathered, JokesPinoy.com was born, a website that let the user share their jokes and let them have dialog with other users as well. Since the website has been launching, tens of thousands of visitors are coming each day to read jokes and have fun on the website and too as giving their opinion on the jokes they read. We hope from JokesPinoy.com that this website may provide you some grin and happiness, Life is Short so have fun on it. DISCLAIMER: Some of the jokes, photos and videos found in this site aren't created by us, they may be created by our users or they simply get it somewhere in the net just like 9gag, youtube, metacafe, vimio and etc. We respect copyright information which is posted here including funny pictures and funny videos. If encase there are files posted here in our site which is possessed by your and you don't want to share it to anybody then fell free to contact us to remove it. Majority of the language used on this site was in tagalog and some are bisaya that are both filipino language which originated from Philippines, in case you want to interpret the joke to english you can used an online translator to interpret it from tagalog to english.